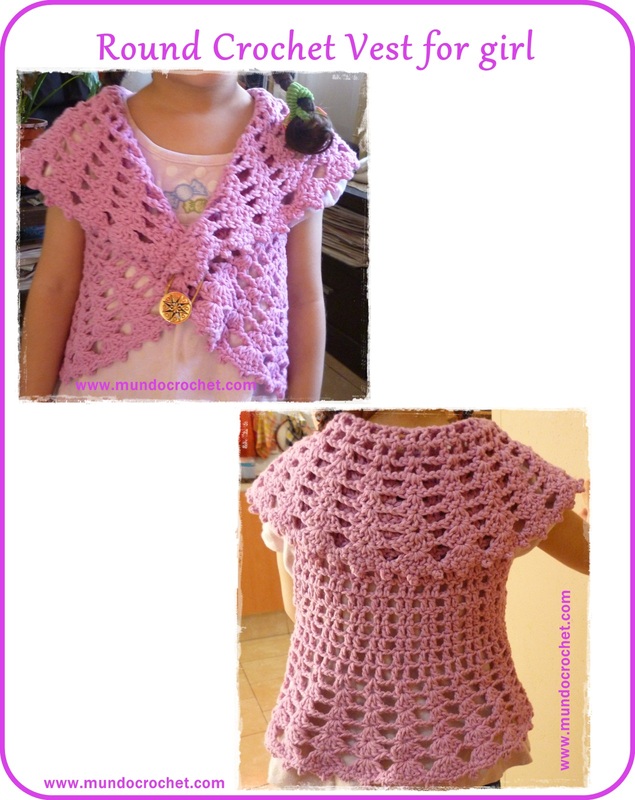 This entry was posted in Kids, Patterns, Vests and tagged Kids, Patterns, Tutorial, Vests. Thanks for tell me about this. I’ve solved the problem. Thanks for your comment! I’d love to see photos. Beautiful! I loved the colours. Thanks for share it. What weight yarn did you use? Worsted or sport? Beautiful, thanks!! I use sport yarn. The yarn is 3 mm width. Thanks for your comment! I would love to make this for my grand daughter, but she is 12 years old. 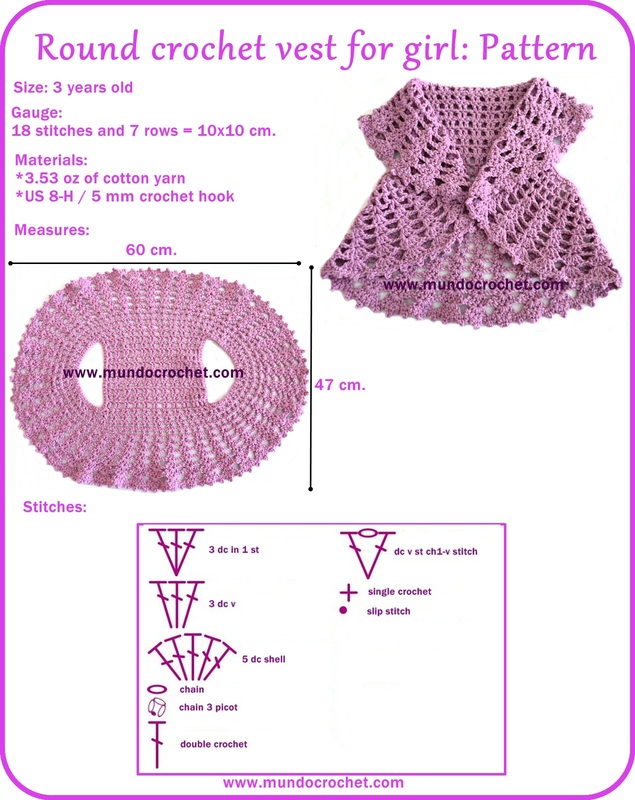 For a 12 years old girl you have to crochet a bigger rectangle (widht=widht of the back of your grand daughter; high enough so, when you crochet the chains for the armholes, enter the arms), the rest of the steps are the same. Soledad, there is no link for a size chart… can you please post it. This pattern is size 3 years old. I dont have a size chart. 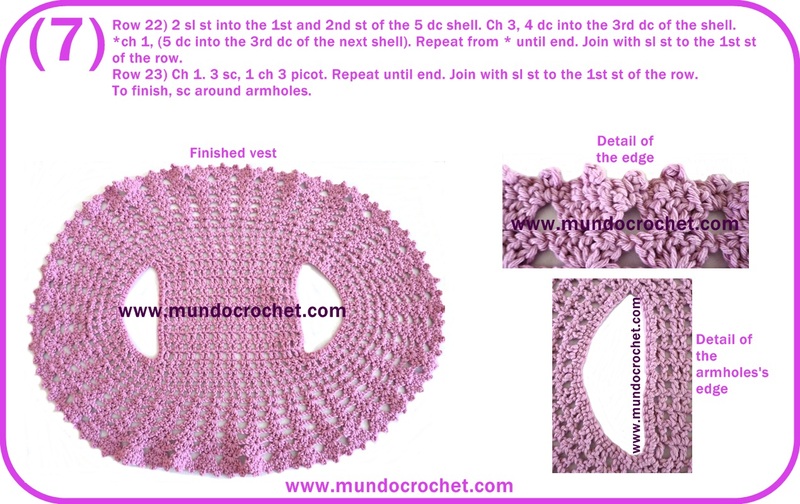 To change the size you only have to crochet a bigger/smaller rectangle and add/quit chains for the armholes. Could you post the size chart? I would love to make one for my 9 yr old granddaughter. Thank you!!!!! I love this vest. Starting my 3rd one now. You’re welcome! Please share the pictures of your vests. I’d love to see them! Hi, I would like to see your size chart for other ages. I would love to make one for my granddaughter. Thanks for your comment. I dont have a size chart. 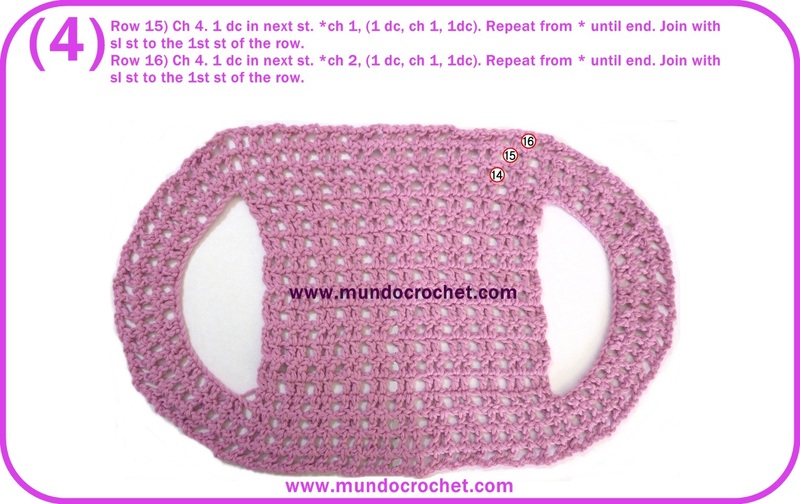 To change the size you only have to crochet a bigger/smaller rectangle and add/quit chains for the armholes. 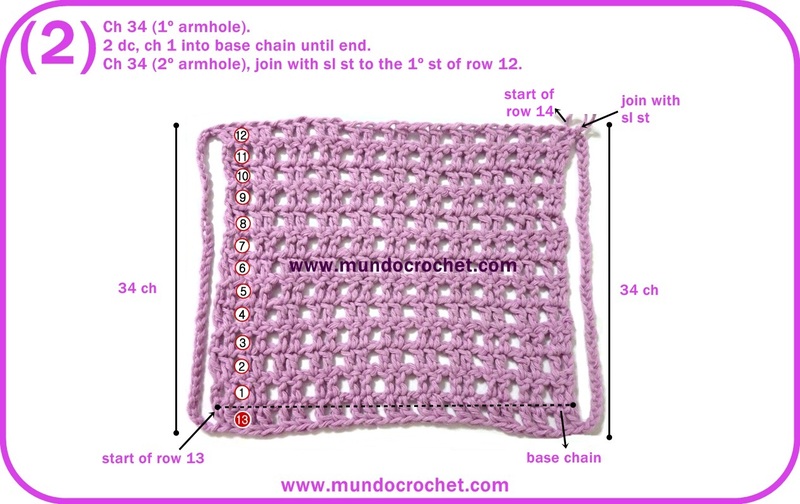 Row 1: You have to crochet 1 dc in each chain. Love this! Having trouble though. 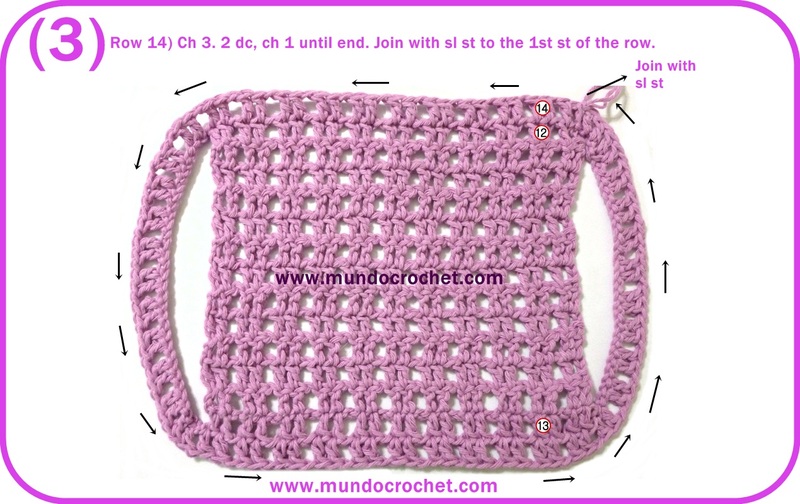 Row 2….why are we doing the chain 3, 1dc in next stitch? I do this and I end up with too many stitches. Help! This is going to be my granddaughter birthday gift! 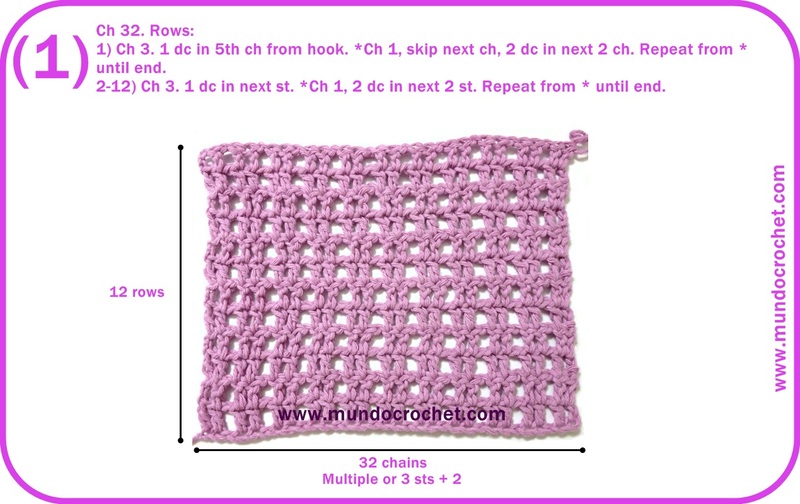 You have to crochet 3 chains only in the first chain of the row, it replaces the 1st dc. Crochet 1 dc in the 2nd stitch of the row and 1 chain. Then you have to continue crocheting 2 dc, 1 chain, 2 dc, 1 chain… until end. Can you use worsted weight yarn for this? Yes, you can you use worsted weight yarn. You’ll get a larger vest. I have finished the square for the back and like your photo, finished with the starting tail in the lower left and rest of my yarn coming from the upper right (after an even number of rows). It looks like your next photo has the first armhole starting from the upper LEFT and going down, continuing with row 13 and then the right arm hole going up and then going across the top to the left for row 14. How do you do this without either frogging or adding a row (which you did not) so the yarn is coming out of the correct corner? 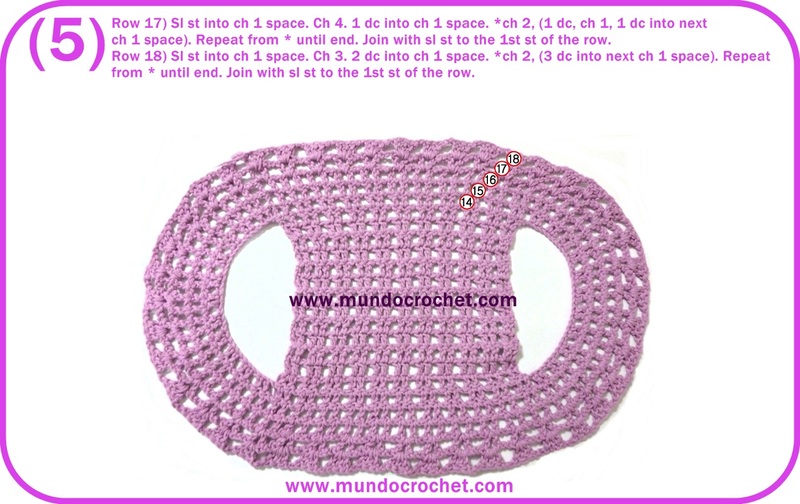 Ch 3, turn and crochet 1 dc in the 2nd dc of the previous row. Hey. I tried making it it size 7 but I got too many ruffles I dont know why? Can you plz help ? To avoid ruffles repeat round 20 instead of rounds 21 and 22 and then crochet 4 dc instead of 5 dc as seen in the pattern. CAN THIS BE ADAPTED INTO AN ADULT PATTERN JUST BY INCREASING THE SIZE OF THE BACK AND THEN MEASURING THE PLACEMENT OF THE ARMS, ETC? Of course! You can adapt this pattern to any size. This pattern was perfect! Quick and easy! I have started this vest but cannot figure out what to do on row 13. Have asked designer for help but no reply do you think you could explain it to me? Tried watching video but it is in Spanish and could not follow it. Would appreciate any help. Want to make for 2 great granddaughters. Love it! I made it for my 11 month old so I made the rectangle on the back smaller than yours and kept following your pattern for the remaining rounds. I am a beginner with crochet and your pattern was very clear to me. First attempt worked out beautifully without any mistakes, thanks to you! Thanks for your kind words. I´m glad that you liked it. I’m a little confused. Still on a learning curve. On part 2 it’s say 34 chain then 2dc, ch 1. Am I supposed to tie off to make 2nd armhole? It does not say but how do I get to the second armhole? Can you help me what cotton yarn I can use for this project as I not able to find sports yarn? Also want it to be wearable for any season. Can I please have the pattern for the girls vest via email so that I am able to follow the pattern when I don’t have access to the Internet. I find it difficult noting where I am up to and viewing the picture steps as I go being so helpful that emailed copy would be a fantastic help to me. Love the pattern very much I’m going to make it for my great grand daughter. I like the look, I have 5 great granddaughters and got to make one or five. Thank you.